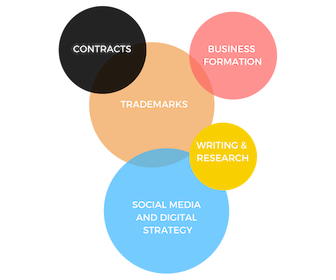 I’m a New York City-based attorney and digital strategist with over a decade of experience advising clients and organizations on the practical applications of an increasingly digital world. I’ve represented a wide variety of clients in the entertainment, fashion, e-commerce, arts, advertising, nonprofit, and media industries. On any day of the week you might find me serving as in-house counsel for a nonprofit healthcare organization, acting as Of Counsel/trademark specialist for a boutique NYC law firm, or advising select clients on intellectual property (IP) and business strategy matters. Prior to practicing law, I was engaged as a social and digital media strategist for large, international organizations. This experience infuses my law practice with a unique perspective and insight into the spaces in which my clients build, promote, and protect their businesses. Over the years, I’ve had the pleasure of working in other diverse fields including anti-violence advocacy, race and ethnicity relations, criminal and family law, and legal marketing. When I’m not wearing my lawyer hat, I’m planning a trip, laughing in the group chat, snuggling with my cat, watching movies, starting (not finishing) a book, and generally trying to love life. Currently Into: Parisian cocktail bars, historical Fiction on Netflix, my cat's purpose in life, high-cut swimsuits, K-Beauty, designing a backyard oasis, yogurt in glass containers, champagne on weeknights, and hitting “unsubscribe”. Contracts, LLCs, strongly-worded letters, etc. For select referrals. Please inquire directly. Not offering these services at present. Check out Odegard Law, LLP or reach out for a referral. you’re welcome to reach out with inquiries for speaking, working together, quotes for articles, referrals and to give compliments … glowing, fabulous compliments. ©2019, Nakia D. Hansen | Attorney Advertising. Prior results do not guarantee a similar outcome.